Learn how to budget your money in a way that works for you. The practice of creating and sticking to a budget isn’t very popular. In fact, nearly 60 percent of Americans admit they do not budget — even though listing income and expenses is a basic and essential part of staying on track financially. When broken down into percentages, a budget can help you understand how much of your money should be going where. When you’re exceeding your budget in certain areas, you’ll see exactly where you need to cut back. To help you take control of your financial situation, here are some options and instructions for building a budget. The first step in learning how to budget your money is to list your actual income and expenses. To reach your ultimate goal of having a monthly budget, take your annual income after taxes and deductions, then divide it by 12 to get an average monthly income. This step is particularly important if you are a freelancer or consultant and have irregular income patterns. When it comes to your expenses, you should review them from an annual perspective as well, as many costs — such as your car registration — occur annually. Once you’ve broken your costs down into individual expenses, you can lump some of them together into categories. For example, you could lump housing-related expenses like your rent or mortgage payments, utilities and homeowners or renters insurance into one category. 50 percent of your monthly income should go to your needs: Place items like housing costs, groceries, utilities, healthcare costs, and transportation expenses into this category. 20 percent of your monthly income should go to savings and debts: Include everything from your student loan and credit card payments to retirement savings and emergency fund contributions. 30 percent of your monthly income should go to discretionary spending or wants: Items such as going to restaurants, vacation expenses and gadgets fall into this category. 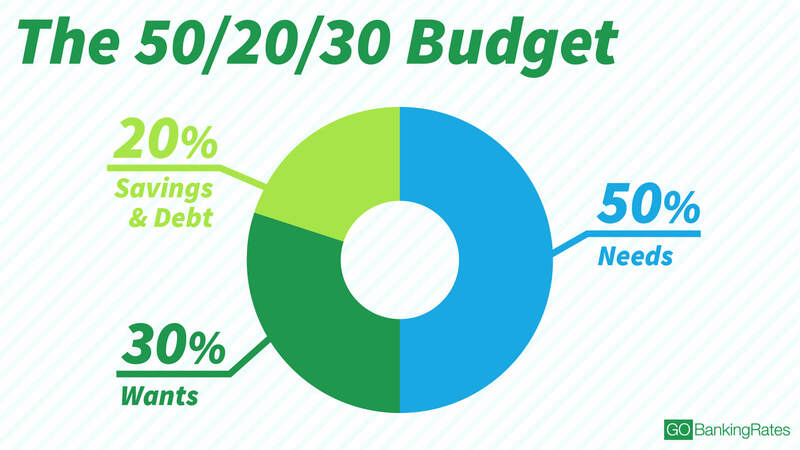 The idea behind a 50/30/20 budget is to set aside enough money to cover essential costs, debt payments and contributions and still have enough money left over to budget for things you enjoy. Although you can use recommended budget percentages, you should adjust your personal budget breakdown to fit your unique financial situation. For example, you might have a large family, in which case your food costs will be a larger part of your family budget than a traditional budget percentage breakdown might be. Similarly, you might have larger healthcare costs than the average family, in which case you’ll have to drop the allocation in another budget category to cover your expenses. Money management firm Fidelity tweaked the 50/30/20 budgeting model into a 50/15/5 rule of thumb, in which 50 percent of your budget goes to your essential needs, just like the original model. After that, Fidelity recommends you stash away 15 percent of your budget into a retirement account, such as an IRA, and allocate 5 percent towards an emergency fund to cover unexpected and one-off expenses. The remaining 30 percent in the Fidelity 50/15/5 model is available for discretionary expenses, just as in the 50/30/20 budget. There are many different recommended budget percentages, but ultimately you need to evaluate your personal financial situation to choose the best budget for you. It’s more likely that the best budget for you is a combination of several different recommended budgets that you will tweak over time until you find the perfect budget. The entire principle behind budgeting is to help you keep track of your income and expenses and make sure that you’re not spending more than you are earning. Whether the 50/30/20 model, the 50/15/5 rule of thumb or some other budgeting strategy works best for you, the important takeaway is that you analyze your cash flow so you can begin a systematic process of balancing your budget. When you can comfortably pay all your bills, save for retirement and enjoy yourself with some discretionary spending along the way — you’ll know that you have found the budgeting model that works for you. Declutter, simplify and refresh your important money matters. GOBankingRates > Saving Money > Budgeting > Recommended Budget Percentages: How Much Should You Spend?